In light of NASA's recent evidence that liquid water flows on present-day Mars, the release of sci-fi film The Martian could not have come at a better time. When astronaut Mark Watney (Matt Damon) is left behind on Mars without enough air, water or food to survive, his solution is to "science the s**t" out of it…" but what would you really need to do to survive on the Red Planet? 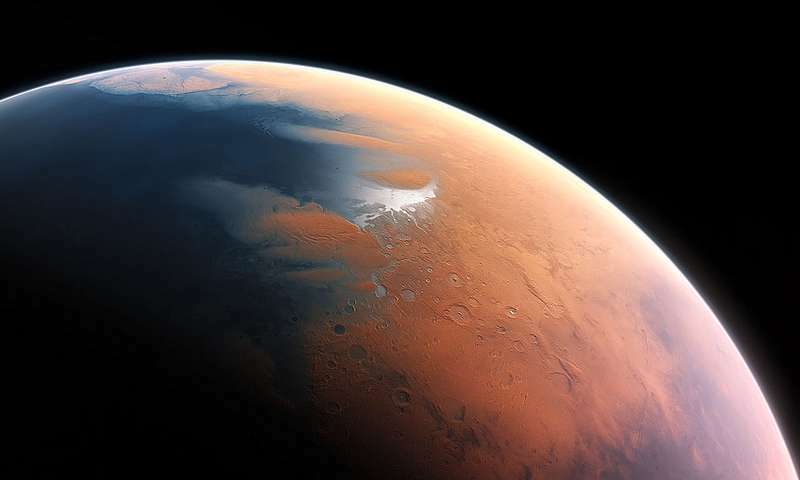 Curtin University astrogeologist Martin Towner, who worked on the ill-fated Beagle 2 spacecraft, says humans would have to contend with Mars' freezing temperatures and low air pressure for a start. A typical day on Mars features a temperature best described as "Siberian cold", ranging from -20⁰C to 0.5⁰C. You could embrace your inner earthworm and try living underground but Dr. Towner suggests that won't solve all of your problems. "You can't breathe the air so you have to either bring it all with you, or make it on Mars," he says. Assuming you managed to breathe, stay warm and survive your first few days on Mars, the next big problem you would face is growing food. "The native outside temperature is way too low for plants, so you need a greenhouse," Dr Towner says. Unfortunately the low pressure on Mars isn't ideal for plant growth either, as plants rely on atmospheric pressure to draw water from the soil. If astronaut Watney wanted to guarantee the production of edible food, his best bet would be to invest in a pressured chamber, most likely before leaving Earth. Additionally, Mars has no life that we know of—and that means none of the microbes that encourage plant growth on Earth. "The soil is probably very good in nutrients and trace elements but would have no fungi, microbes or organic matter," Dr Towner says. Getting the challenges of day-to-day 'Martian' life off your chest, is not as simple as pulling out a satellite phone and calling home. Dr Towner says the main issue is a 15-minute time delay due to the speed of light. "You could have an email conversation but not a Skype call," he says. These challenges aside, with NASA's recent water discovery, life on Mars may be closer than imagined. "It seems that the more we study Mars, the more we learn how life could be supported and where there are resources to support life in the future," NASA Mars Exploration Program lead scientist Michael Meyer says. Mars is probably alive and has been for many eons. Probably alive before Earth was! WE...are probably really Martians! Martian cellular life is IMHO, likely to verrry likely underground far enuf for water to be liquid, and that would be shallower then you might think given the prevalence of extremophiles here on our own planet. Life may be adapted to the different chemistries extant there at Mars std T and P. Even volcanism may still be there. Look how life here flourishes near deep sea vents in T=>700 degF! Insulated solar greenhouses pressurized with air made there and heated will raise all food we need. Just do not make the domes toooo big or put all valuables under one dome. Best living is underground in sealed dust filtered nuclear powered complexes with several really good airlocks. Good compact nuclear power is key to survival there. Good robotics a must.... And good doctors! Martian microbes may find us quite tasty. You lost me at repeated use of 'enuf'. Just couldn't go with the three extra letters huh?